The most used surface in a museum or gallery is the floor. Flooring materials need to be as beautiful as they are durable. Flooring must reflect the aesthetics of the artwork and space. Daily traffic from tours and visitors take a toll on the floor finish. Today, museums pick dependable, modern materials when building new or renovating old spaces. Before the mid-1940s, wood, hemp, jute, straw and oilskin decked high foot-traffic areas. Through the 1990s, the use of synthetic materials soared. The promise of durability made vinyl, carpet and engineered wood flooring ideal choices for public spaces like schools, hospitals, museums and malls. Synthetic products are easy to clean and inexpensive to replace. But, the chemicals used to produce and install synthetic products contain formaldehyde, asbestos and other cancer-causing carcinogens. Due to the late discovery of toxic compounds in synthetic products, modern public spaces now use low-VOC or volatile organic compound products. To quell public safety concerns, museums and gallery owners have switched to sustainable, non-toxic flooring materials like bamboo, cork, concrete or epoxy resin. Flooring made of wood complements any style or decor. More expensive than synthetic wooden products, wood flooring is an investment that adds long-term value to real estate. Where to Use: Keep away from water and food. To get the look of an organic product, people turn to vinyl and laminate. Laminate contains a photographic layer that mimics the texture of wood, stone or tile. Where to Use: Great for use in high foot-traffic areas where food and drinks may be present. Ideal for modern creative spaces, concrete creates a durable, long-lasting surface that’s easy to maintain. Where to Use: Good for smaller museums or gallery spaces where foot traffic is limited. Cork is a renewable resource. Because it’s an eco-friendly option, the use of cork has tremendously grown in popularity where temperatures dip below freezing. Where to Use: Keep away from areas where food or drink are present. The least expensive option for flooring, carpeting will never go out of style. An alternative to rolled carpet, carpet tiles are easier to assemble and replace when damaged. Where to Use: Great for use in smaller areas where visitors may stand for longer periods of time. Wall coverings and the art that adorns them aren’t the only stunning features of a popular museum or gallery. Flooring materials affect the visitor experience. Flooring can create a sense of warmth or sterility. When renovating or designing a museum-quality space, the choice in flooring should be both utilitarian and eye-catching. 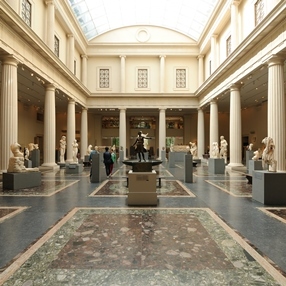 What flooring is used in your favorite museum or gallery? Do you favor softer finishes like carpet or laminate? Or, do you prefer organic materials like stone and wood? Let us know your opinion!